EEEEEeeeeeeeeeeeeeekkkkkkkkkk!! I am so so so very late! I apologize for my tardiness, but I had serious computer issues today and then I wasn't home so I didn't have pictures of my projects (we've been on vacation all week using my parent's house at the beach. It wasn't the best weather but we had fun nonetheless!). Ok, enough of that! Does anyone want to see my project? 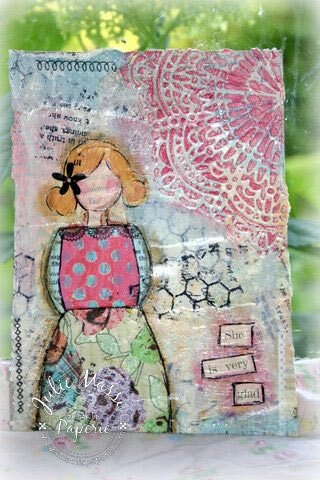 We started by making a collage background using vintage and patterned paper scraps, paint, gel medium, and Wendy Vecchi's Embossing paste. We added lots of layers, lots of highlights and paint to bring dimension and color. We used stencils and embossing paste to add texture - I love, love how well the doily detail came out in the paste! Some of the girls then used their canvas to paint, or stamp on but I decided to make an "old school" SheArt girl, by cutting out paper shapes, adding paint for detail. I added outlines with a black pen, rub-ons from Pink Paislee, some Unity Stamps from Christy Tomlinson and words from one of my vintage books. We had such a fun day with these!! 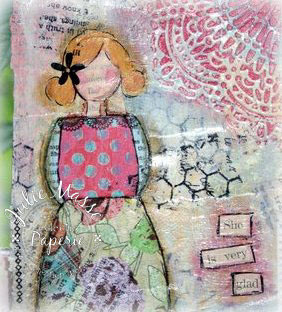 I'll even share a picture of the canvas my daughter made using one of the Prima girl stamps. Thanks for stopping in!! Have a great weekend! Wheeeee Julie..vacation at the beach sounds brilliant regardless the weather...one of my fav places to go and chill. 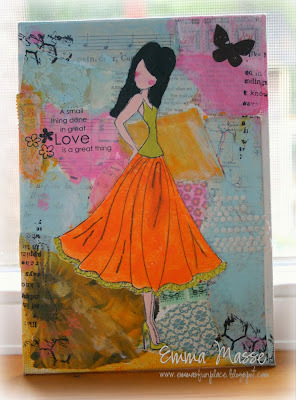 Looooooving your she art canvas and that doily is stunning!! Your daughter did an amazing job with her canvas.....sure runs in the family. Your canvas turned out oh so beautiful. Love that doilies texture in the corner. Sounds like a fun day of art making. That's a real beauty, Julie - and lovely to see the results of the family crafting too. And your daughter is a chip of the old block...sweet! !